Grosgrain blog has a great upcycled sweater blog that keeps us on our theme from yesterday's sweater tutorial for vase covers. 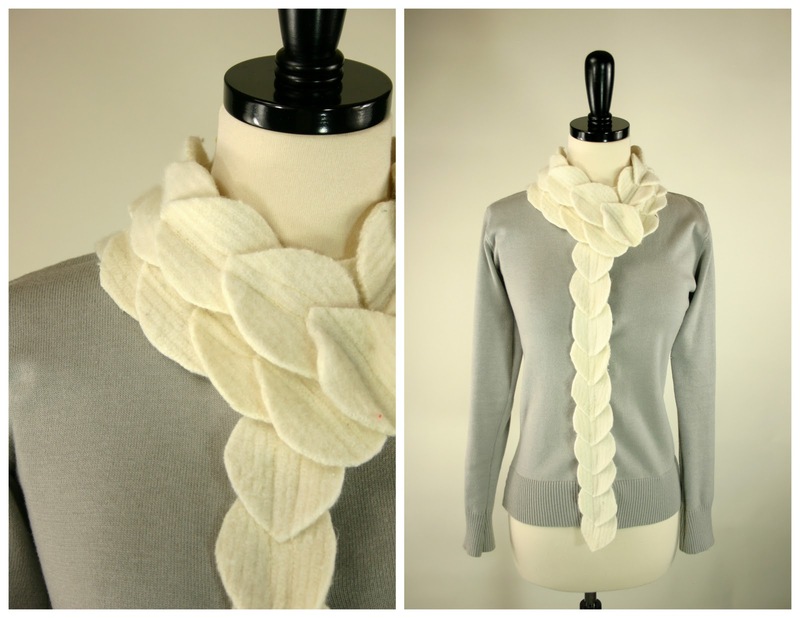 We love this scarf and can totally see it keeping us warm on those cold winter days! Be sure to check out their blog for even more DIY! I tried to add the leaves on the sleeves as well but it looked too bulky against the thin sweater. I might suggest a looser or thicker sweater to add the sleeve embellishments. Or using a thinner wool, like craft felt to make the leaves. Doing the sweaters late in the day has really helped to make me look sharp when picking up Lily. People must think I dress this way all the time. 1. Cut out some 3" leaves from felted wool. 2. Overlap the leaves and sew them together. 3. Once you have a chain long enough to line your neck sew it to the collar. 4. Make another chain of the same length and sew to first chain. 5. Make another chain and sew it to the front of your cardigan. To hide the buttons on my cardigan I sewed the leaves on one side but overlapped it over the edge. 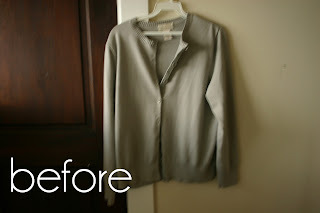 The cardigan is still able to be buttoned and unbuttoned.